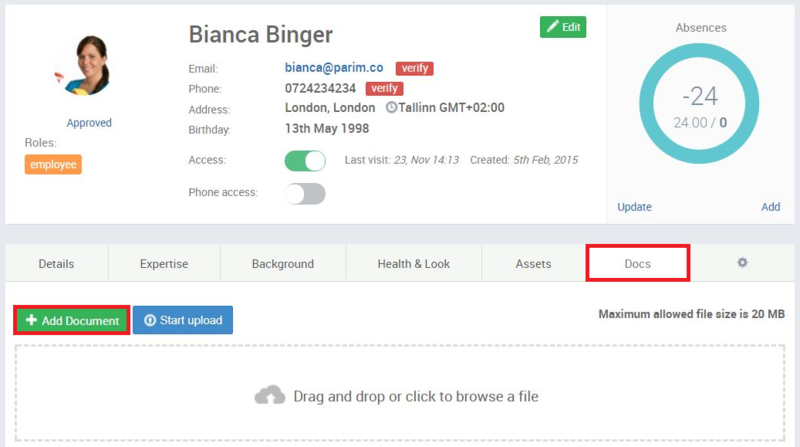 If you go to the Person Profile in the Documents section you can upload, view and edit any files that are connected to the employee and that you think should be accessible from the system - contracts, CV's, background checks etc. 2. Drag and drop a file directly from one of your folders into the gray 'Drop File Here' area. 3. When you're done choosing the documents you want to upload, add a description for them if you want, click on 'Start Upload' and the file(s) should now upload and appear in the files list. 4. You can also choose whether this document is visible to the person or not. To make a document visible to this particular employee just click on the 'x' icon under 'Visible to Person'. To delete the document, click on the little trashcan icon on the right hand side of it.